I don’t want to be too obvious, like I was thinner, younger, blonder (in every way)… eh, let’s go with the old standby of winging it and see where it takes us, which should be interesting as half the time I’m not even sure I can make it to ten with these listicles (and often don’t). So ten things ways I am the same and different from my younger self using the comparatives more and less. 1. I was more arrogant, I thought I knew it all. Now I actually know it all, but in a completely non-arrogant way. 3. I used to take more care of myself. When I was younger I wouldn’t leave the house unless my hair was done, and my nails manicured, and my skin as smooth as a baby’s behind. Now… well now I’ve got kids, so if my teeth are brushed I’m good to go. 4. I used to be less discerning about men. Back then I had a crush on Luke Perry, who no one has ever seen again after 90210, now I have a crush on Matthew Perry who keeps doing awesome shows. (if you haven’t seen it, check out Go On). 5. I used to be more adventurous. The sky was the limit. Literally. In fact, the only thing I regret not doing when I was younger that I really, really, wanted to do is skydiving. There is no way in hell I’m going to do that now, because… well, I’ve got kids. Also, I’m now a scaredy cat. 7. I was more self-conscious, and I embarrassed much, much more easily. Then again I hadn’t given birth in front of what felt like the entire hospital staff plus a few students. 8. I had less to lose. Which kind of explains the adventurousness. I guess the older we get, the more we appreciate the things we have and the more conscious we are of how easy it is to lose it all. 9. I have more love. I love more intensely, yet less dramatically. 10. I have less time. This one is really true, yet really hard to swallow, and also the only one I’d really change (along with the effects of age on my metabolism, and gravity on my body). I used to have all the time in the world, summers were endless, fifty minute class periods were excruciatingly long, now the years fly by at a steadily increasing pace and I can accomplish unimaginable feats of organizational prowess in only fifty minutes. So sometimes I’d just like to stop time for a moment and be able to simply sit and think, remember, and record, the sensations of a specific moment, to savor it, and really enjoy it, live it, before it’s gone forever. This entry was posted in Uncategorized and tagged meme, memories, monday listicles by bonnybard. Bookmark the permalink. Fabulous list! I especially like #1 and #9. So true. Heh, thanks! 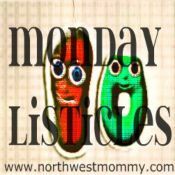 Great idea for a listicle! 9 is a really great one! I wouldn’t go skydiving either. WAY too chicken! I know! But it looks like so much fun too, and think of the great stories! Luke Perry to Mathew Perry seems like a very mature decision. And you’re right about having more fun now. I think it goes along with being less self-conscious. I hate when you call me mature! ha, ha! I love how you did this, the back and forth of it all had me nodding in agreement 100%! thanks! I wasn’t sure it was going to make any sense to anyone but me! I love the more/less rhythm of this post. thanks! the right rhythm and alliteration are my two favorite things in writing! I get it… in fact, there’s probably a reason why I haven’t still done it! Amen on #3, Sista! #4 – I used to have a crush on Matthew Perry when he played Chaz on the show Second Chance. Luke Perry was too cool for me. Me too on #7. Cared WAY too much what others thought. I still do, just not to the extent that it will prohibit me from doing something I really want to do…well, at least most things. #10 is awesome. I’m right there with you. I remember sitting in classes in HS watching the last stinking five minutes of the period tick away on the clock, loathing each second. Now, I would love to have all those seconds back to just sit and do nothing. Oh I love it when you wing it. This list wrote itself it feels and I nodded all the way through. I love so much more now too, but it is a solid, no drama kinda love. And hey, you did ten!! And about the love thing, as far as I’m concerned a harder yet easier kind of love. Harder because it’s much deeper and more intense, easier because it’s more steady. I love where this list took you. I do mourn the ENDLESS amounts of time that I once had. How does the clock behave so differently though the decades? Oh how I wish I had read yours before struggling with mine. I would have SO copied…I mean been inspired by yours. ;P Only difference was number 5…I did jump out of a plane but like you would definitely NOT do it today and for the exact same reason. My favorite is number nine! It is so true. I also have absolutely no idea where all my time has gone. I used to go to school full time, work full time and still have time to go out with my friends…now after an 8 hour work day I’m done.